For use on LS-based engines with single-bolt camshaft. 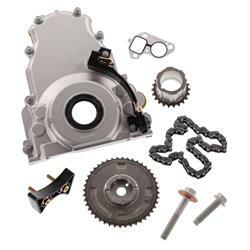 Kit includes 4X 1-bolt cam timing gear, crank timing gear, heavy-duty timing chain, timing chain damper, LS2/LS3 timing cover, 8 timing cover bolts, timing cover gasket, timing cover seal, cam sensor, cam sensor harness bracket, cam sensor harness, 3 camshaft bolts, cam sensor bolt, balancer bolt, and 2 water pump gaskets. The included cam sensor has a 3-pin connector whereas the factory VVT equipped plug has a 5-pin (the two additional wires go to the VVT Solenoid). To use the new sensor, you will need to remove the wires from the 3-pin and reuse the original 5-pin connector or you can simply swap the cam sensor from the existing VVT cover to the new cover.